Sol Stein has been a playwright, editor and publisher, as well as a lifelong student of the written word, and now he’s a tutor to students of creative writing (he’s even turned himself into a computer program for those who can’t get to meet him). From the outset, he states firmly that his book is not about theory but about solutions, about fixing flawed writing, improving good writing, and about creating interesting writing. But just because his book isn’t about theory, doesn’t mean it isn’t a thorough discussion of the art of writing. Stein himself is fond of particularity, the telling detail that reveals a world in a few words, and this, combined with his training as a playwright, means that he inclines towards close reading of a text and thorough analysis of the use of words. Which is my inclination too, which is perhaps why I like this book as much as I do. Books about writing written by playwrights and script editors tend to have this tighter focus, this interest in analysis, perhaps because every move on a screen, every step across a stage has to do something. There is no waste. The same holds true for any piece of writing, long or short, but writers are so often profligate with words, there is so much space available on the page, it doesn’t occur to them that this is so. A few hours with Sol Stein will change their minds. An editor’s job, according to Stein, is to help a writer to express his or her intentions. However, those intentions are often inappropriate. A writer’s correct intention should be to provide the reader with an experience superior to the reader’s encounters in everyday life. Any insights gained are not necessarily the result of writerly insight, but because the writer has created the conditions which enable the reader’s pleasure to become an edifying experience too. Thornton Wilder, Stein’s own mentor, once said that a writer deals in the unspoken, what people see or sense in silence. That’s as good a place as any to start. The unique selling point of this book is that it’s handling non-fiction and fiction alongside one another. Or rather, Stein is focusing on fiction but demonstrating how in certain instances these skills are transferable to non-fiction writing too. I confess I have slight doubts about this approach as I come to the book as a writer of non-fiction and felt I was being sold a little short in some ways – there are fewer chapters which focus specifically on non-fiction writing, and some readers might be resistant to sharing, as I was. Nevertheless, Stein always talks sense, and one piece of sensible advice is that although fiction and non-fiction writing require different mindsets – fiction evokes emotion, while non-fiction primarily conveys information – they both require practice and imagination. In which case, let’s get aboard the Steinmobile and see what the man has to offer. Stein’s method draws heavily on exemplars, from modern classics and new writers, and from Stein’s own published work, and he starts at the beginning, with openings, and goes on to the end. As one might expect from a former playwright, he’s big on immediacy, something he identifies as a very modern trend, brought about by the influence of film. Cut the narrative summary, cut the description – this just slows down the story – show what’s happening. Characters come first – they generate the story. Let them speak and act, describe what they do in their voices, and make the description visual. Stein also has a knack of reducing big concepts to their basics. Use markers – those small, telling details which tell you everything about a character in a few words. It’s not stereotyping, not if it’s done well. Plot – that’s about wanting something really, really badly. Drama comes from the individual characters having different scripts to work to. The crucible, the closed environment is what generates tension … and so on. Stein is also, as you might expect, good on dialogue. Dialogue is invented, not overheard, which is possibly the most useful piece of knowledge a writer can ever receive. (And yes, dialogue is something I get very bothered about. This isn’t transcription, you know.) Also, vitally, Stein spells out this showing and telling business. Anyone who has ever been through a process of critique will at some point have been told to show rather than tell. Stein shows you how to show. For non-fiction writers, much of the above does also apply. Stein himself presents the techniques mainly in terms of journalistic examples, though he does recommend books for those of us who prize the essay form. Wisely, I now think, he doesn’t try to tackle what he doesn’t know about. 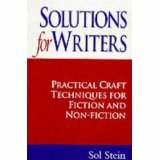 But for writers of fiction and non-fiction alike, revision is vital, and this is something that Sol Stein talks about all the time. Which pleases me immensely. A first draft is just that, a draft, a first walk-through rather than a finished, polished item. Likewise, Stein encourages writers to revisit their work and edit it line by line, purging it of unnecessary adjectival verbiage. The editor in my soul warms to this. Less is so very often more. Sol Stein is a good companion in this book; amusing, opinionated, with just a little touch of ego on his side, and most of all, a man who knows what he’s doing. If you can’t sit across the desk from him, face to face, this book is a very good substitute. You’ll learn a lot about the business of writing. Reviewed by Maureen Kincaid Speller a reviewer, writer, editor and former librarian, is our book reviewer and also works for WritersServices as a freelance editor. Want to Be a Better Writer?